Australia is home to a wonderfully diverse range of plants, with over 20,000 species. Approximately 85% of the flowering species are endemic, that is they are found nowhere else in the world! Australian plants are very well adapted to the harsh conditions of most of the Australian environment – fire, drought and infertile soils. Eucalyptus (gum-trees, ironbarks, stringy barks, mallees) and the dominate much of the forests and woodlands of coastal and sub-coastal Australia, with Acacia (wattle) being one of the main under storey plants. There are over 700 Eucalyptus species, and some similar and closely related trees in the Corymbia (bloodwoods and spotted gums), Lophostemon (brush boxes) and Angohphora (apple gum) genera, and over 1000 Acacia species. 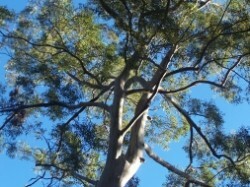 As you travel inland, eucalypts become sparser and more stunted, Acacia species take over as the dominant woody plant. Most of our acacias (different from the South American and African species) do not produce true leaves after the initial sapling stage ad instead photosynthesize with enlarged petioles (leaf-stalks) known as phyllodes. Further into the outback even the acacias become sparse and are replaced by spinifex, chenopods such as saltbush, and other arid land plants. Lush and ancient rainforests include tropical, subtropical and temperate forms, with variations within these. Brilliant wildflowers adorn many heathlands and open forest areas, the most famous being those of the southwest corner. Eucalyptus (many of them known as ‘gum trees’) are our best-known trees, and although they are now planted all over the world, most of the 700+ species are endemic to Australian (i.e. found naturally nowhere else) , with just a very few native New Guinea and eastern Indonesia and one to the Philippines). They and the Corymbia are immensely important to many animal, providing nesting hollows (for possums, microbats, many owls, possums and other birds, native bees etc. ), high branches for nest-builders, copious nectar and pollen (for honeyeaters, lorikeets, megabits, gliders and many insects), manna (an insect exudate fed on by honeyeaters, gliders and others), leaves (for koalas and greater gliders), sap (for gliders) and seeds (for some parrots and finches). Corymbia (bloodwoods, spotted gums and relatives) and Angophora (apple gums, often with very twisted branches) are very closely related to Eucalyptus and look very similar. Lophostemon (brush box) is also very similar, but although the trunk is easily mistaken for eucalyptus, the leaves spread horizontally rather than vertically, giving a different look to the tree (and a lot more shade underneath).